In honor of Stroke Awareness Month, we have a guest speaker on Optimizing care for patients with acute ischemic stroke. Orange Coast ENA Chapter Representative Update Report 1/10/19- Lake Tahoe, CA -Member survey results show members want more meetings, plan to schedule more meetings in 2019 -Stop the Bleed event, partner with GLA chapter on 1/29/19 @ Mission Hospital -Annual education event planned @ CHOC 8/8/19 -Looking to involve more with Long Beach, reaching out to Long Beach hospitals -potential fundraising ideas- CEN/CPEN review corse again (we had successful course in 2018) -next meeting @ Fig & Olive 2/5/19 Newport Beach, CA. Orange Coast Chapter has been busy with educational and team building events. In October for Emergency Nurses week we delivered baskets and fliers to all 25 orange county Emergency Departments. We had a Certified Emergency Nurse and Certified Pediatric Emergency Nurse review combo this year. This event had 27 RN’s in attendance, the funds raised will go back to our ENA Foundation for scholarships. We awarded 3 chapter scholarships this year. For the 2018 ENA National Conference in Pittsburg we had a record number of delegates serve for Orange Coast. Of the 64 delegates from California, 14 came from OCENA. We also are had wine and paint night for ED RN networking and socialization with the newly elected 2019 board. Our next chapter meeting is scheduled for December 11, 2018 at Spaghettini in Seal Beach. 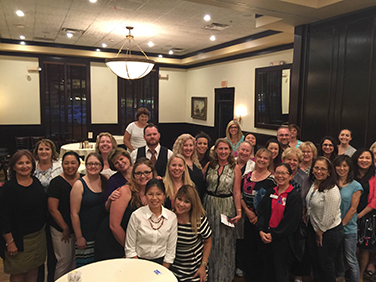 Orange Coast ENA just had a successful chapter meeting on 5/3/18 at Zov’s Restaurant. Our guest speaker Magnolia Medical Steri-Path provided education regarding blood culture contamination reduction. Our next chapter meeting on 8/18/18 will be combined with an Educational Event at St. Jude Medical Center in Fullerton. We are excited to offer the following topics: Trauma, Von Willebrand, Stroke, Transgender and intranasal Narcan. There will be an additional room at the event with educational posters and micro-lectures. The deadline for scholarship applications is approaching on 6/1/18. There are 2 Gary Sparger $500 scholarships as well as 1 Vicki Dippner Robertson $1000. We plan for 5 delegates to attend ENA National Conference in Pittsburg. CPEN/CEN review will be rescheduled for October 2018, in Orange at Care Ambulance Headquarters. The “Light the Way” lantern initiative continues and has been photographed at various locations in California. Our current membership is 440, with 11 new RN’s and 4 new student members. April 14th there is a volunteer opportunity at the Orange County Recovery Collaboration, they need help with sign in and ushers. This is a great time to get involved with preventing drug use in our county and is heavily supported and sponsored by many agencies, organizations, and legislative reps! We look forward to seeing you soon! Keep an eye out for our ENA Lantern, roaming through our ER’s and our cities. Recent Events: Blood drive @ CHOC March 5-9 Nursing Career Fair at CSUF 3/12, OCENA hosted a boot Upcoming Events: Educational event 8/18/18- Fullerton, CA- St Jude’s Medical Center Treasurer Report: Revenue: $11,998.83 Membership Report: 8 new members. 2018 New Board Members and OCENA Chairpersons: Amanda Webb, Past President; Jillian Lee, President; Angela Reyes, President Elect; Julie Paine, Secretary; Wanda Pritts, Treasurer; Jillian Baker, Social Media Chair; Lili Novcovik, Fundraising Chair; Jolie Hultner, Education Chair Upcoming Chapter Meetings: January 9, 2018 at 1830 located at Orange Hill Restaurant. March 13, 2018 at 1830 located at Magliano’s Restaurant. May 2018, TBD August 18, 2018, Educational Event located at St Jude Medical Center, December 2018 TBD. New Membership Promotion: Emergency Nurse Week Wellness Event, Wine and Paint 10/10/18, CEN and CPEN review courses. Sponsoring 4 chapter members for Leadership in New Orleans January 2018 417 members as of 11/17/17. Last meeting at Capital Grille went well. We raised $133.00 at our last meeting for the ENA Foundation. Our next meeting is June 22nd at Seasons 52 in Costa Mesa with a speaker featuring a blood culture collection device to prevent contamination. RSVP at enaorangecounty@gmail.com. August 17th annual OCENA educational conference and meeting will be at CHOC- more information coming soon. Scholarship applications due June 10th- Gary Sparger scholarship $500 available to RN’s looking to advance their degrees with a BSN or higher. NEW SCHOLARSHIP: Vicki Dippner-Robertson hardship scholarship $1000 available for those who are advancing their emergency nursing practice, used at awardees discretion, examples would be ENPC, TNCC, Conference registration, or student loan payments. Reaching out to chapter hospitals to attend staff meetings to present the benefits of ENA engagement. Summer Social being planned for a “Meet the board” and networking opportunity with OCENA. January 2017 Report: For Emergency Nurse’s Week, the board made baskets of goodies with a chapter flyer, applications and thank you cards, these were delivered to each Emergency Department in Orange County, all 24! 2017 Board members were voted on and the announcement will be made at our Holiday Chapter Meeting on December 6th at the Summit house in Fullerton. The meeting is will begin with a Speaker: Melissa Yager, MS, RN, CNS, ONC from Sharp Memorial San Diego, CA. Title of Talk: Reduction of Opioid Analgesic Dosing with a Multimodal Protocol. Objective: Discuss use of multimodal analgesia in varied patient populations. It is free of cost with an amazing dinner and board meeting to follow, with raffles and prizes! Our last meeting was held after an Educational Event in August that had 31 attendees and had great evaluations. There were 6 speakers that spoke of PTSD, Human Trafficking, Strokes in Lil’ Folks, Trauma Education and more. We the continue to recruit and on last count have 384 members! We also have an exciting facebook and Instagram page, the links are on the state website, please follow us! The Orange Coast Chapter members have been involved in several exciting activities, recently. August 26, we started the morning with a Chapter meeting where we reviewed the upcoming calendar of events, the treasurer’s report, and current topics related to nursing under Government Affairs. Following our chapter meeting we sponsored an all-day educational offering which was held @ Hoag Hospital in Newport Beach. Over fifty attendees enjoyed the interesting and relevant topics from nine dynamic speakers. We offered six hours of both RN and EMS CE’s. A shout out to Destiny Douty from Care Ambulance for her generosity in sponsoring our breakfast and luncheon. One of our Chapter members, Christine Marshall, RN was flexible and willing to add to the conference at the last minute with an amazing presentation on Healthcare in Cuba. Another Chapter member, Vicki Sweet, RN presented on How to get Published in a Nursing Journal. Our Keynote speaker was the Honorable Orange County Supervisor, Andrew Do. His topic was related to the care of patients with Mental Health care needs in Orange County. We were made aware that he serves on the CalOptima Board of Directors—which is the largest County Operated Health Plan in California, with over 800,000 members and responsible for the coordination of benefits for individuals who are mild to moderately mentally ill. He went on discuss his dual roles with CalOptima and the Mental Health Board focused on the alignment of our patients’ physical and mental healthcare around the “whole person.” Additional information on the speakers and their topics is included in the brochure on our website. In addition we were thrilled to have ten delegates from our chapter join the National ENA conference in LA on the evening of September 12th. The following two days we discussed resolutions and then went on to enjoy the wonderful educational sessions that were offered through Saturday. Finally, Kathy Robidoux, RN, our Chapter Treasurer hosted our board meeting at her lovely home on October 11, 2016. We put together enough baskets filled with treats for delivery to all twenty-four of the Emergency Departments in Orange County for Emergency Nurses Week. We also included in the basket information about the ENA and any upcoming educational offerings. Carla E. Schneider, RN, MSN, CEN.